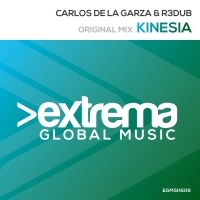 Carlos De La Garza and R3dub bring you Kinesia, the next huge trance reelease on Extrema Global Music. A true trance thoroughbred, Kinesia hits all the right spots with its anthemic riffs and peak time euphoric feel. Another classic in waiting from Extrema Global Music. 'Kinesia' is available now from Beatport and iTunes.